Title: Deux anne es de mission a Saint-Pe tersbourg. 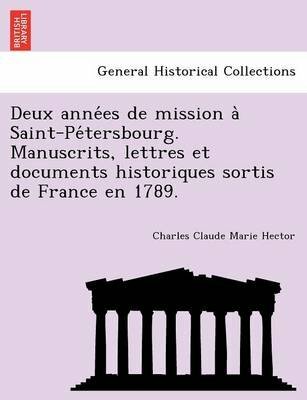 Manuscrits, lettres et documents historiques sortis de France en 1789.Publisher: British Library, Historical Print EditionsThe British Library is the national library of the United Kingdom. It is one of the world's largest research libraries holding over 150 million items in all known languages and formats: books, journals, newspapers, sound recordings, patents, maps, stamps, prints and much more. Its collections include around 14 million books, along with substantial additional collections of manuscripts and historical items dating back as far as 300 BC.The GENERAL HISTORICAL collection includes books from the British Library digitised by Microsoft. This varied collection includes material that gives readers a 19th century view of the world. Topics include health, education, economics, agriculture, environment, technology, culture, politics, labour and industry, mining, penal policy, and social order. ++++The below data was compiled from various identification fields in the bibliographic record of this title. This data is provided as an additional tool in helping to insure edition identification: ++++ British Library Hector, Charles Claude Marie; 1867. iii, 264 p.; 8 . 9455.ee.9.